We can modify the flowchart we created in the previous lesson. 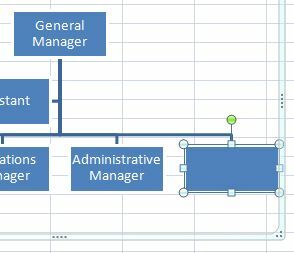 1) We click on the rectangle that houses the position for General Manager and we click on the right button in our mouse. This will open up the options menu. 2) We select add shape, followed by the alternative "Add shape below" since this is the level we want to create. 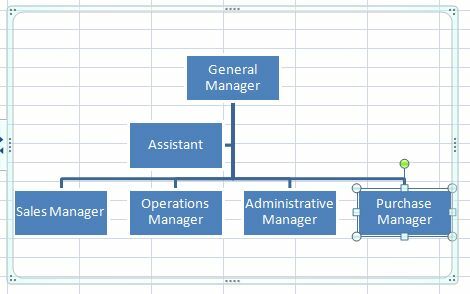 3) A new rectangle below the General Manager will have been created. 4) We write in the new position: Purchases Manager. 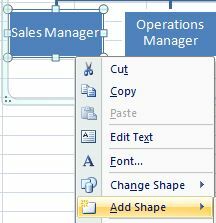 a) Click on the Sales Manager rectangle. Click on the right button in your mouse to open up the menu. 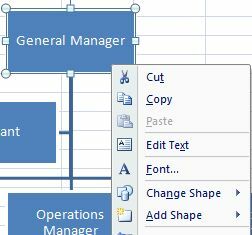 b) Select "Add shape", and more specifically, "Add shape below"
c) A new rectangle will have been created in the flowchart of our worksheet. We can write here what we need to add. 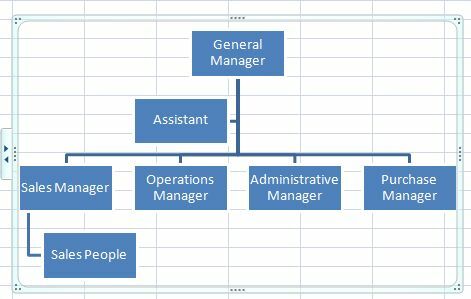 d) Since there are three sales people who depend from the Sales Manager, we write that information and our Flowchart will have been modified.